The Huddersfield Town chairman is to cycle to Wembley to raise money to allow disadvantaged children the chance to see the club's play-off final. Dean Hoyle will leave Huddersfield three days before the League One play-off final against Sheffield United. Mr Hoyle is hoping to raise £45,000 to allow 1,000 children to get a free ticket and travel to the stadium. He said: "Times are hard, so let's do it and raise some cash to bring football to local children." Up to 50 other cyclists will undertake the fundraising ride alongside Mr Hoyle, leaving the Galpharm Stadium on Wednesday 23 May and reaching Wembley on Friday 25 May. The match is on the Saturday. 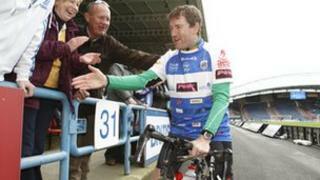 Earlier this month Mr Hoyle was among more than 200 Huddersfield Town fans who rode 250 miles from Yeovil to Huddersfield to raise money for the Yorkshire Air Ambulance. It was the third season running that the club had organised a charity bike ride. When the club reached last year's play-off final at Old Trafford a club appeal raised about £25,000 to provide children with tickets to the game. Huddersfield lost Tuesday's game 2-1 against MK Dons but qualified for the final 3-2 on aggregate.